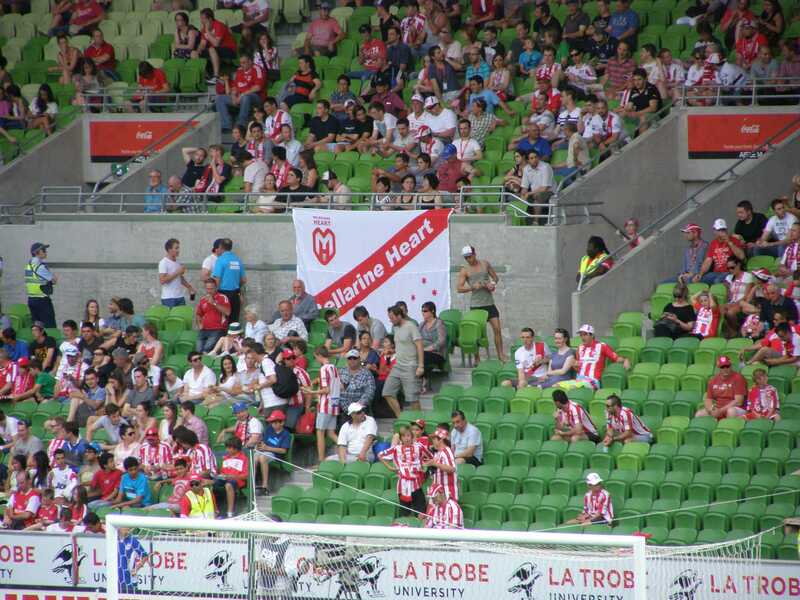 Melbourne Heart threw away a two-nil lead and eventually shared the points in a three-all draw with Newcastle Jets at AAMI Park on Saturday evening. It was one of the most open games seen in Melbourne this season and some woeful defending contributed to the goals and the excitement and neither coach was happy with that part of the game. Melbourne Heart welcomed back skipper Fred for the clash, but lost Mate Dugandzic to a broken metatarsal which will probably keep the exciting winger out for 6 to 8 weeks and perhaps more. It is an injury which requires careful treatment. The Jets were close to their nominal ‘first eleven’ apart from Michael Bridges and Tiago Calvano. 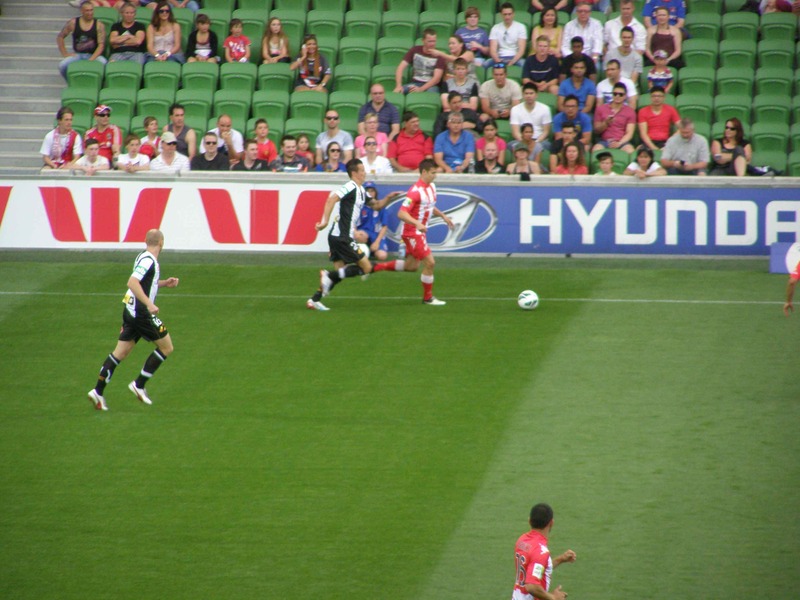 From the kick-off the ball found its way to Patrick Gerhardt deep in defence on the right for Heart who sent a long diagonal cross in the direction of David Williams overlapping on the left. Before it could reach the winger Jets full back Scott Neville facing his own goal attempted a pass back to his keeper with his right foot but got it horribly wrong. He only succeeded in giving Richard Garcia the opening to fire the ball past the unprotected Matthew Nash. Time elapsed was less than 40 secs, longer than it would have taken you to read this. In the fifth minute Garcia wearing number eleven sprinted into the box in pursuit of a loose ball only to be brought down by the opposition’s number eleven, Connor Chapman. Referee Jarred Gillet awarded the penalty and Josip Tadic dispatched it into the top right corner. 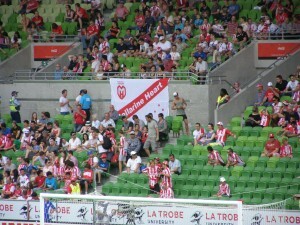 Heart was two-nil up and the late-comers were still taking their seats. Heart dominated the first half, creating numerous openings, while the Jets tried to soak up the pressure without doing much by way of attack until just before the interval, when Berardo Ribeiro fired just over the bar. Two-nil is a precarious score, but Heart went in at the interval in control though probably regretting the misses including a Simon Colosimo header from a Williams free kick which keeper Nash managed to finger-tip away for a corner kick. Gary van Egmond tweaked the Jets’ approach at half-time so that his team pressed higher up the pitch, forcing Heart kick from deep and stretching them. He also made two excellent tactical substitutions bringing on former Heart winger Craig Goodwin, who scored with his first touch in 56 minutes, getting on the end of a diagonal ball from Ruben Zadkovich. 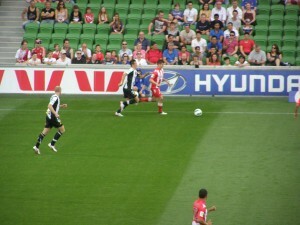 Zadkovich then brought the jets level with a fierce shot into the bottom corner of Bolton’s net in the 63rd minute. Garcia got his second and Heart’s third after Tadic laid the ball wide to Matt Thompson. 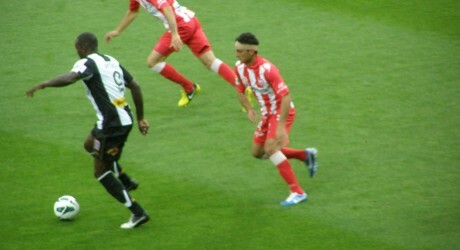 Thompson’s precise pass was turned home by Garcia from ten metres. With only four minutes of normal time to go another Jets’ substitute, James Virgili, who had earlier been booked, was upended in turn by Simon Colosimo for a penalty converted by Ryan Griffiths. Young Ben Garrucio had a chance to win the game for Heart in the last minute of normal time, but his shot flew across the goal and wide of the right-hand post. This was two points thrown away by Heart in the end and they will regret the myriad of first half chances which they spurned. I asked John Aloisi why two-thirds of Heart free kicks result in the ball going backwards from where it is more difficult to mount an attack? Was this a tactical instruction by the coach or a mind-set developed by the players? Aloisi said that he wanted his players to retain possession of the ball but he did not want it played back to the keeper from advanced positions, but this is something Heart will have to address. It contributed to them being under pressure for much of the second half. David Williams contributes a lot with his speed and shooting power, but there are times when he lopes forward rather than sprinting to provide an option in attack. More generally the home team has to avoid switching off when it gets the kind of lead it took to the end of the first half if it is to move up the ladder and realise the promise this youngish team shows when it is at its best.